Food Costs > How Much Does a Bag of Ice Cost? How Much Does a Bag of Ice Cost? When it comes to ice, your ice cube trays may not be enough. Thankfully, your local store will have bags of ice you can purchase. On average, a bag of ice will cost anywhere from as little as $1 for a 10-pound bag to as much as $6 for a 20-pound bag. The cost of ice will depend on the amount in the bag and the store selling it. NOTE: These are the prices we received. Your results may vary, depending on the geographical location. Also, these prices may change depending on the promotional rate. 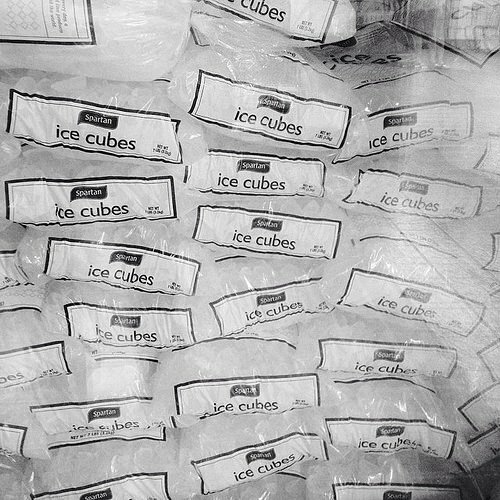 The average bag of ice will come in a 10, 16 or 20-pound bags, and most ice will be made from purified water. Ice will almost always be sold as cubes, but in some cases, you may be able to find cocktail ice cubes, which refer to the smaller cubes used in beverages. Some of the largest brands often found at a local retailer includes Arctic Ice, the Cape Cod Ice Company, Chesapeake Bay Ice, Diamond Ice, Penguin Ice and Reddy Ice. Ice can be purchased at most grocery stores, gas stations, and as mentioned, even fast food restaurant chains such as Sonic, McDonald’s and even Arby’s. This will vary from location to location as some won’t offer bags of ice for sale. If purchasing a bag of ice for consumption, make sure it’s marked with the International Packaged Ice Association (IPIA) seal. This guarantees the ice has met the IPIA’s strict standards. Consider making your own ice at home. If you think you are going to be purchasing more ice in the future, consider purchasing smaller ice trays at a local dollar store. If your refrigerator has an ice making option, consider filling up a cooler the night before you leave. That way, when you wake up, the ice maker will be at full capacity again for another refill. Bags of ice will usually be the same price across town. It is best that you purchase ice as close as you can to home, especially if you are bringing it back for an event.